RRB Chennai came up with an excellent news that is they are inviting the Online Applications to apply for RRB Chennai Group D Recruitment 2018-2019. So, total 2979 rrbchennai.gov.in Grade IV Vacancies are available. Moreover, Track Maintainer Grade IV (Trackman), Gateman, Pointsman, Helpers in Electrical/ Engineering/ Mechanical/ Signal & Telecommunication departments, Porter & Other comes under the Grade IV Vacancies. Therefore, all the job hunters from Tamil Nadu State can make utilize of this golden opportunity by applying the latest RRB Chennai Group D Job Openings 2018-2019. 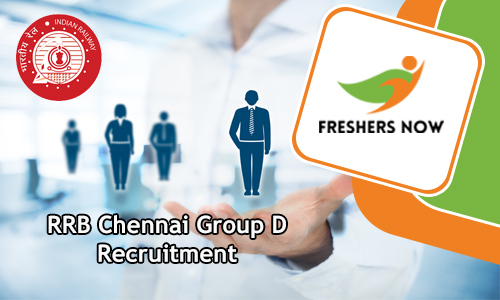 Moreover, coming to the essential details like Starting date, Closing date, Application Fee, Age, Selection Process, Education Qualification, Salary Details, how to apply and download the RRB Chennai Group D Recruitment 2018-2019 Notification and much more stuff are available in the below sections. So, all the people just scroll down the article and find out most precious info. Also, go through rrbchennai.gov.in regularly. Many of the people are thinking to apply first. So, all the contenders should notify the complete RRB Chennai Group D Recruitment 2018-2019 Details through this post. Moreover, a couple of days back, the authority of RRB Chennai released Official Notification on their web portal that is rrbchennai.gov.in. Many of them are unable to find the most precious details. And many of them are asking to share the latest RRB Chennai Group D Jobs 2018-2019 information. For that purpose, we have created this article. Therefore, those who are in confusion state about the Eligibility Criteria information can check this article very attentively and find all the info in an order wise. Moreover, we are advising the people that the current 2979 Grade IV Vacancies 2018-2019 might be very helpful for the hob fighters those who are hunting for Railway Jobs. RRB Chennai Group D Recruitment 2018-2019 mentions that all the applied aspirants must and should have 10th class or ITI or its equivalent from NCVT or SCVT in India are eligible to apply for 2979 Grade IV Vacancies 2018-2019. We are here to clarify all the doubts about the RRB Chennai Group D Openings 2018-2019. Before proceeding, all the contenders need to follow some of the requirements that the officials of RRB Chennai stated in the Official Advertisement. Then only, you should proceed to apply for RRB Chennai Group D Recruitment 2018-2019. So, you have a less time to think and apply for the RRB Chennai Group D Jobs 2018-2019. Because the last date is 31st March 2018. Moreover, those who are willing to apply for rrbchennai.gov.in Openings 2018-2019 are suggested to end their Application Process as soon as possible. Now, the candidates who are interested to check the age details can refer this section. As per the Official RRB Chennai Group D Recruitment 2018-2019 information, all the applicants must have minimum 18 Years and maximum 31 Years. And also, the Age Relaxation is applicable as per the government rules. So, remember to check the Age Details in official RRB Chennai Group D Recruitment 2018-2019 Notification. The Official Advertisement is available here. Therefore, click and download the Notification and find more details. And we are sure that you can get all the details from this article. Now, all of them need to look at the application fee details. So, We all know that there is a separate application fee for all the categories. Therefore General Category candidates need to pay Rs. 500/- and others should pay Rs. 250/-. Along with this article also check the official web portal of rrbchennai.gov.in to get the complete information. The department of RRB Chennai stated that all the applicants must and should clear the Written Test (Computer Based Test), Physical Efficiency Test (PET), Document Verification and Personal interview rounds. First of all, you have to participate in the Written Exam. Those who will clear the written test are only eligible to attend for the further rounds as mentioned in the above. And also, all the selected people can receive Rs. 1800/- per month. The official RRB Chennai Group D Recruitment 2018-2019 Notification is attached in the below. In case any of the people have any doubt related to the current article then check the Advertisement. All the candidates can receive the above pay scale fromthe authority of RRB Chennai. We all know that before applying for RRB Chennai Group D Recruitment 2018-2019 all the contenders must and should have minimum and maximum age limit. Therefore, check the below details. Age Relaxation is also applicable for the candidates. General candidates need to pay Rs. 500/- as an application fee details. Remaining (SC/ ST/ Ex-Serviceman/ PWD/ Female etc) should pay Rs. 250/-. Those who had completed their 10th class or ITI or its equivalent from NCVT or SCVT in India are eligible to apply for RRB Chennai Group D Recruitment 2018-2019. Refer all the eligibility criteria details. We hope all the candidates got enough details regarding RRB Chennai Group D Recruitment 2018-2019. And visit our website Freshersnow regularly.